A VIKING Shipowner Agreement offers everything you need to say goodbye to fluctuating service costs and unwelcome surprises forever. ​​​​​​​It's a uniquely customizable concept that covers almost all products and brands in a variety of predictable, fixed-price structures. Supported by 10 strategically located warehouses and a state-of-the-art service management system, the 280-station VIKING network works faster, more efficiently and more reliably than anyone else in the business. The last thing you need is a rigid servicing contract that either can’t be changed, or costs too much to adjust. Now just one agreement can gradually be expanded to cover all of your evolving safety equipment and servicing needs. 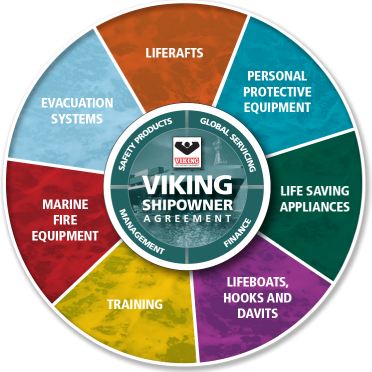 Start with a comprehensive VIKING Shipowner Agreement or simply add vessels and safety products as needed.